The new Native American Village is now open and ready to add to your list of “favorites” when you visit This Is The Place. When you step into the Village setting you are transported to a time long before the Mormon pioneers and early settlers arrived in the Salt Lake Valley. The Village represents the tribes of the northern and southern land in Utah. The southern “land” is easily distinguished by its red rock landscape and the northern “land” is set in a representation of granite and green landscape. The newly completed Teepee represents the dwelling of the Shoshone of northern Utah, whose homes and lifestyles were significantly different than the southern tribes. This new Teepee, the largest in America, can easily seat 110 guests in the comfort of air-conditioning in the hot weather and has heat for visits during the cooler months. In the Teepee, our Native American Dancers perform a variety of ceremonial dances and are always a guest favorite! This time-honored tradition of dancing has spanned centuries and you can see their shows daily during our Summer Season that begins in the spring and ends in late October. Running through this area is a stream where children can race wooden boats down through the rocks and water! As you step into the red rock you will see a representation of the southern landscape where the tribes of this area dwelled. There is a female and male Hogan, rock features and a beautiful new Medicine Wheel. Our “Balanced Rock” is made to replicate the popular rock features scattered throughout the red rock country of Southern Utah. The Petroglyphs on Balanced Rock are replicas of designs and symbols carved into the surface by the pre-historic and indigenous peoples of Utah. Balanced Rock is a great place for guests to take a photo or selfie! There are also fun rock-type features for children to climb in this area. 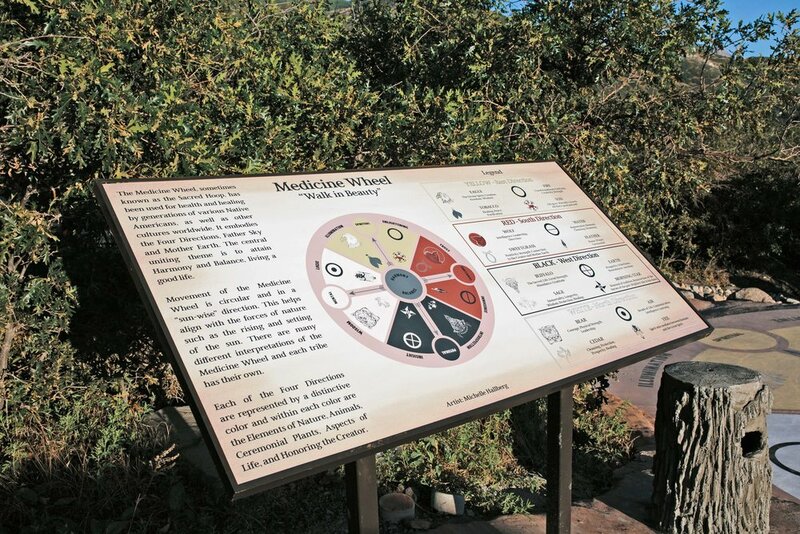 The new Medicine Wheel, sometimes known as the Sacred Hoop, has been used for health and healing by generations of various Native Americans, as well as other cultures worldwide. You will see a “map” of this wheel that will help you understand all the elements and movements that go along with it. The central uniting theme for the Medicine Wheel is to help you attain Harmony, Balance and to live a good life. When you step into the Hogan, you will feel the coolness of Mother Earth, sacred to the Navajo tribe. 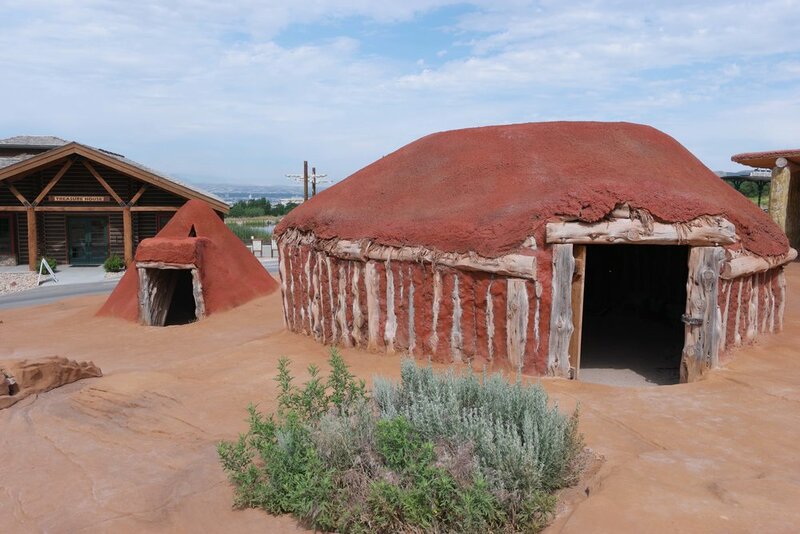 The male and female Hogan's were built using timbers from northern Arizona and southern Utah, ritually cut according to Navajo tradition. In the Hogan, you will hear the stories from Native American interpreters or see a beautiful wool rug being woven. And you won't leave empty handed. The Native American Village is a favorite station for craft making. An arrowhead necklace or perhaps a sand painting craft will be yours. Your visit with the Native American's, who dress in their traditional regalia and dance throughout the season, demonstrate native crafts and share their language and stories with you, will be one of the highlights of your visit to the Village. Facts about Utah's tribes: In the territory that later became Utah, there were five tribes; Shoshone, Piute, Ute, Goshute and Navajo. The Park's Native American Village portrays the joint contributions of these five tribes to our heritage. With several notable exceptions, relations between the Native Americans and the settlers were relatively cordial during the settlement era.